When we were young, we were told the phrase, if you don’t have anything nice to say, better to say nothing at all. 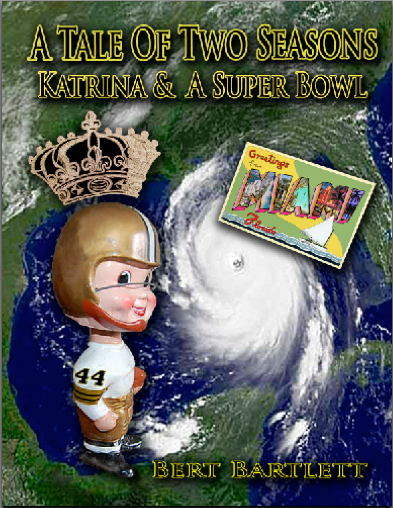 In that vein, there won’t be any analysis about what transpired against Tampa Bay on Sunday in the Superdome. The Saints losing the game wasn’t even an issue. There were others. It was a day to turn off the television, or leave the stadium at halftime, when Atlanta was up 21-0 at home over Carolina, whose players have had their bags packed for months. The first string in New Orleans, too, should have been given the rest of the day off. Incredibly, all the writers in that morning’s edition of the Times Picayune, and four of the five Talking Heads on Fox, all picked the Saints to win. Former head coach Jimmy Johnson should have at least known better. When a pro team is motivated by the slim chance of something else happening beyond their field of control, their collective focus will inevitably be sloppy. This is high likelihood in the jungle, where football is very much an all or none game, and the subconscious tends to make its mind up quickly beforehand. And people are more likely to get hurt at half speed. Saints’ coaches were between a rock and a hard place from a preparation standpoint, but some of their decisions left lots to be desired. There is a school of thought teams need to play their best football as they head into the playoffs, regardless of the circumstances, but after losing their last regular season games last year before tromping through the Super Bowl, the Saints didn’t have anything to prove along these lines. And Pride is overrated propaganda in the latter stages of the NFL season. The truth is, plenty of pro players are relieved when their teams don’t make the playoffs, because their bodies feel like trash bins by this point. The best that can be said about last Sunday is that it’s over with, that more players didn’t make the injury list, and that back-up quarterback Chase Daniel isn’t starting for New Orleans to kick-off 2011. There’s a consensus that Daniel is the Saints’ quarterback of the future, but this page isn’t in that number that he has the goods, not yet anyway. He needs plenty of work and experience, and should have gotten more of it against the Bucs. Hopefully, Malcolm Jenkins won’t be a post-season casualty of the sordid affair with Tampa Bay. Of more pertinence was watching Sunday Night Football, to get a bead on the Saints first round playoff opponent. When it comes to other teams, we needn’t be as kind. The Dunce Of The Week award goes to the St. Louis Rams. Their receivers may have set a record for most consecutive dropped passes in league history. Not only did they drop them, they looked like they had never caught any, and the football kept meandering through their arms like water rocket toys from under the Christmas tree. All of their receivers on the field that evening were eligible to be promptly cut Monday morning. Their coaches didn’t have much of a clue either, as evidenced by Ram running back Steven Jackson, by far the best player on the field, hardly even being integrated into their offensive game plan. Huh? All the Rams had left was baby faced quarterback Sam Bradford lamenting Seattle defenders not dropping his interceptions. During telecasts, the NFL runs advertisements for the Tiny Football League, for kids probably too young to be wearing tackle equipment. The line between the ads and the game was a blur. But hey, don’t blame the Seahawks, they didn’t make the rules, they just played by them, scrapping enough together to win the game, and their division, with a woeful 7-9 record. Their back-up quarterback, Charlie Whitehurst, had a workmanlike effort, though it looks like he was plucked out of an internet café, sipping latte. S’up, dude? Matt Hasselbeck may start on Saturday afternoon, and even though he gets hurt about as often as when he sneezes, it doesn’t really matter who is playing quarterback for Seattle. Like in October when they played the Saints here, they moved the ball and scored some points, and should be expected to do so again. The Seahawks have a cadre of small, quick running backs, especially spot player Leon Washington (#33), and nobody in Black & Gold could cover rangy receiver Mike Williams the last time they met. Where Seattle was outclassed the first time around was on defense. Linebacker Lofa Tatupu is a playmaker, but this unit is skittish and wafer thin in depth. The Stones Of The Saints should be able to spank them into submission as the game wears on, assuming they aren’t too sore, and the Saints have a healthy enough running back to take advantage of it. Chris Ivory is a significant loss for this team, as at some point in the post-season, on some drive, on somebody else’s field, somebody will be needed to pound it down an opponent’s throat. Having to look hard for one, a mild positive from last week was that Reggie Bush looks more in sync, and his number may be the main one out of the backfield called on Saturday. He should welcome this timely stage of opportunity, and should be leaned on. Coaches should not discount his strength between the tackles, but he needs carries to show it. The Stones, and running backs, should be prepared to max protect Drew Brees, as the Seahawks will likely come try to come at him like flies, frantically waving their arms high, in hope of batting a few passes into turnovers. The swat and the strip are in vogue as defensive strategies. The Saints’ game plan needs to be well grounded, and patient. Last Sunday’s circus act should not negatively affect the Saints, other than who won’t suit up because of it. Even at three quarters mast, the Saints should have enough to get by the Seahawks and pop their little balloon, though stranger things have happened in the NFL. The ball bounces funny, refs often like to hear themselves be cheered for by the home team’s fans with some of the calls they make, and the playoffs do bring intensity out of pretenders as much as contenders, at least early in these contests. Seattle’s crowd will be quite loud, enough to quickly drown out any remaining sore memories, by players – and fans alike, of 1/2/11 in New Orleans. The Saints just need to advance in the tourney. The margin of victory is meaningless, just like last week’s was.